The tango, possibly the most sophisticated, sensual and seductive of dance genres, is also the most demanding technically. 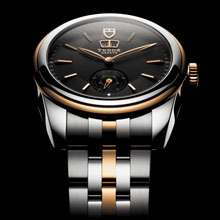 And the rose, a timeless symbol, long associated with the TUDOR brand, evokes beauty, passion and perfection. Inspired by the palpable emotions and aesthetics of the two, and drawing on the characteristic elegance and elan of the TUDOR Glamour collection, the new TUDOR Glamour Double Date is the ultimate expression of retro chic and sensuality. “Smooth, suave and suggestive” best describe the lines of the shining-armour-of-a-case and double bezel in polished steel that exquisitely frame a dial with open-work feuille hands and a domed sapphire crystal. While respecting the shape and proportions of the other models of the TUDOR Glamour collection, the case, for the first time, measures a handsome 42 mm. 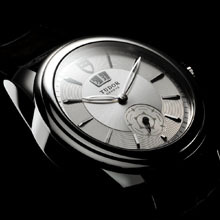 The dial, available in black, silver or dark grey, is distinguished by a dramatic double date window at 12 o’clock and a small seconds counter that makes its debut at 6 o’clock and is subtly adorned by the return of the TUDOR rose pattern, reminiscent of the brand’s earliest logo from the 1930s and 1940s. 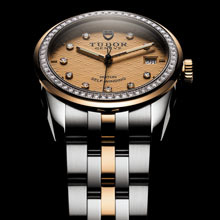 Self-winding and waterproof to 100 metres (330 feet), the TUDOR Glamour Double Date is fitted with a strap in either black lizard or black calf with a crocodile pattern, both with folding clasp, or either a steel or steel and yellow gold bracelet with a TUDOR Glamour clasp.